Halt, Salute and...: Crying Wolf? so I decided to take the dogs for a walk in Reillanne forest. Cinnamon politely declined, however, ("you must be joking, it's bloody freezing out there, Mum!") so I set off with Cookie. 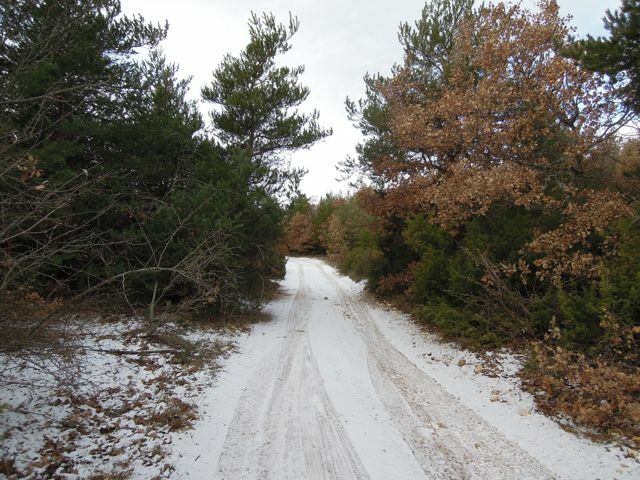 The road was clear and dry all the way up the hill, but there was a nice covering of snow at the forest itself. It seemed like no-one had walked through the snow before us, and once we turned off the lane pictured above onto a narrower trail (the one we followed on the horses last weekend) we were suddenly walking through virgin snow. Virgin apart from some animal tracks, that is. I guessed these were fox prints - they were a little bigger than Cookie's. I didn't think they could be dog prints, as there were no accompanying boot prints, but I suppose they could belong to a stray dog. What on earth does this belong to? I wondered. 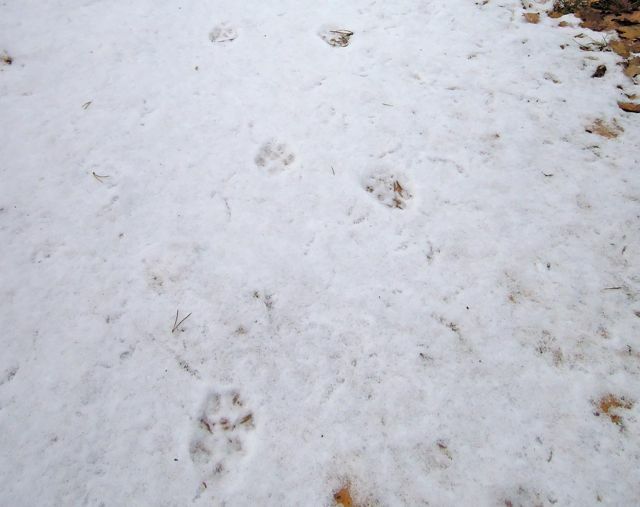 They petered out after a while and then seemed to reappear, although the back feet were now leaving a clearer "paw" print. This time, I actually did a double take, and realised just how big this animal's paws are. I fumbled in my pockets for something to give scale and found a €20 note - this is just over five inches long and just over three inches wide. Those are some seriously big paws. Cookie and I kept our walk short, just in case. Wolf or dog, does anyone out there have an opinion? Hmmm.... whichever it is, I still don't want to meet it! Wow! Very cool to see the tracks, but I agree, I wouldn't want to meet it either! I have no idea but I'd have gone home too. 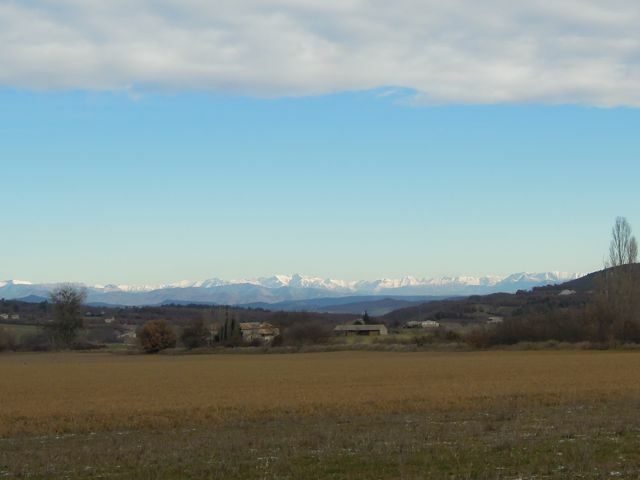 Beautiful pictures of the surrounding areas. I'm not liking the idea of wolves roaming around these parts! I'm going to have to show this to Papa. I'll let you know if I find out anything interesting. Cool... you know there really is a wolf around tho, right? 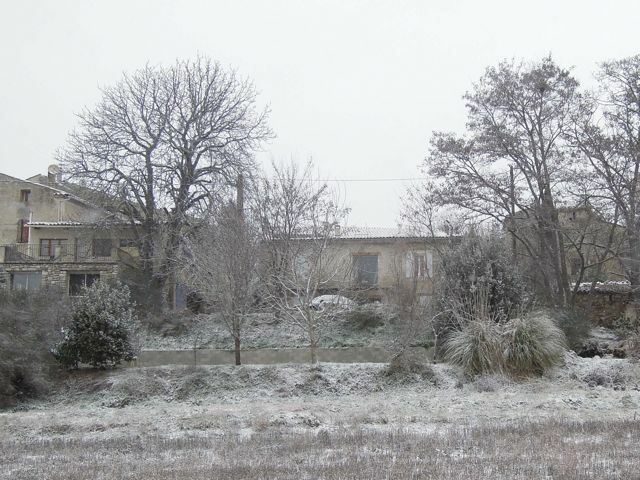 It was in La Provençe last week. 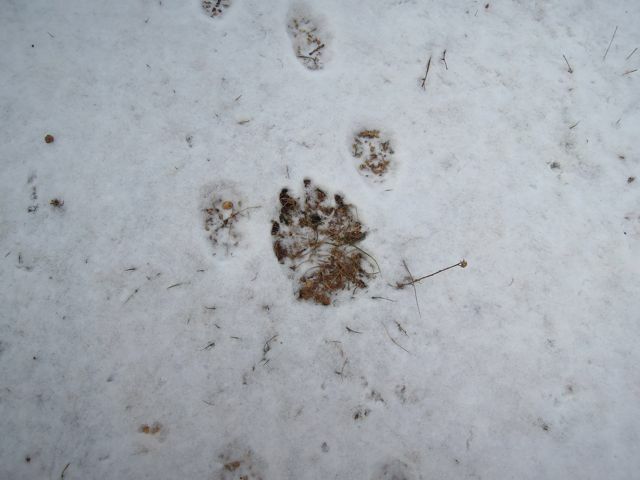 OK - I haven't showed this to Papa yet, but I did just show my husband and he said while there are wolves here (not what I wanted to hear), those aren't wolf prints (apparently they look a little different). He thinks it's a very large dog, like a Great Dane or something. I wish that made me feel better, but I'm still going to be paranoid walking Fifty. 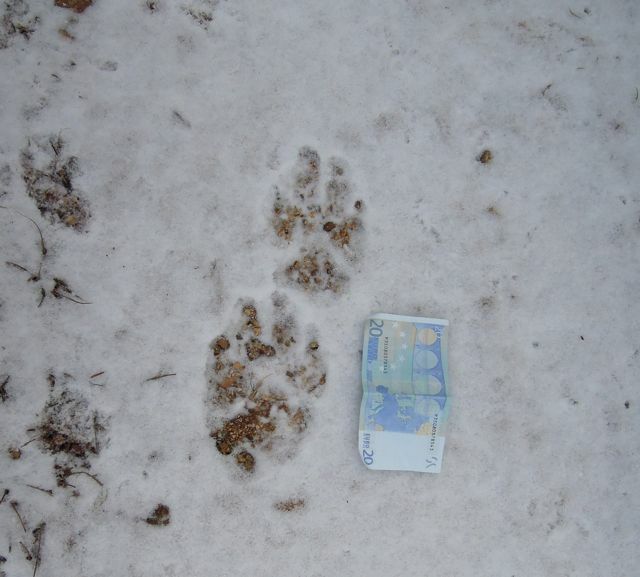 The Gendarmes in Reillanne saw a wolf by the Auberge Pierry a couple of weeks ago, but anyway, I am slightly reassured that the Husband says they're not wolf prints. Although I don't want to meet that dog either. Cookie would probably go for it and then get eaten. And apparently there are lynxes here too - I'm not too sure what the proper plural of lynx is, but again, this is not news that is making me happy! 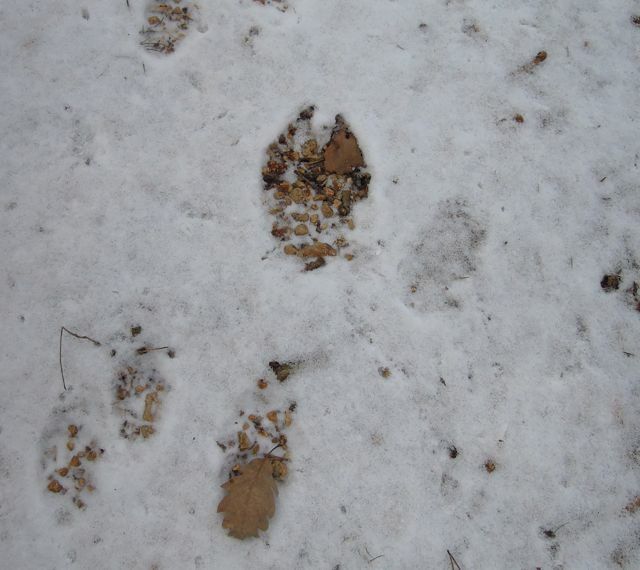 I am not good at identifying tracks but it looks like some large dog like beast was tracking dinner. You made the right choice in heading back. Yikes. I showed the photos to the Maire of Montjustin who said straight away it was un loup. They reckon there's more than one in the area. Gulp.